Update: Key2Enable won the top award at the 2019 Global Social Venture Competition and Magnomer placed in the top 6 of 692 entries worldwide. Being part of the impact investment “ecosystem” these days means you likely have a mash up of issues on your mind because – thankfully – the movement has matured enough to now have factions, detractors, champions, victors and losers. As a social entrepreneur highly focused on solving one problem – in our case, the problem of access to financial products needed to complete college – I have followed the arc of and commentary on impact investing. But I mostly have been playing in my corner, building a business brick by brick with my team, and learning from our early engaged customers. Over the past four years, however, I have gained a weeds-level view of impact entrepreneurialism and investing. I have a bold challenge to put forth to impact investors and to my fellow social entrepreneurs: Invest more seed capital in exchange for more equity. Investors should acknowledge and embrace that social impact companies are uniquely difficult to get off the ground. 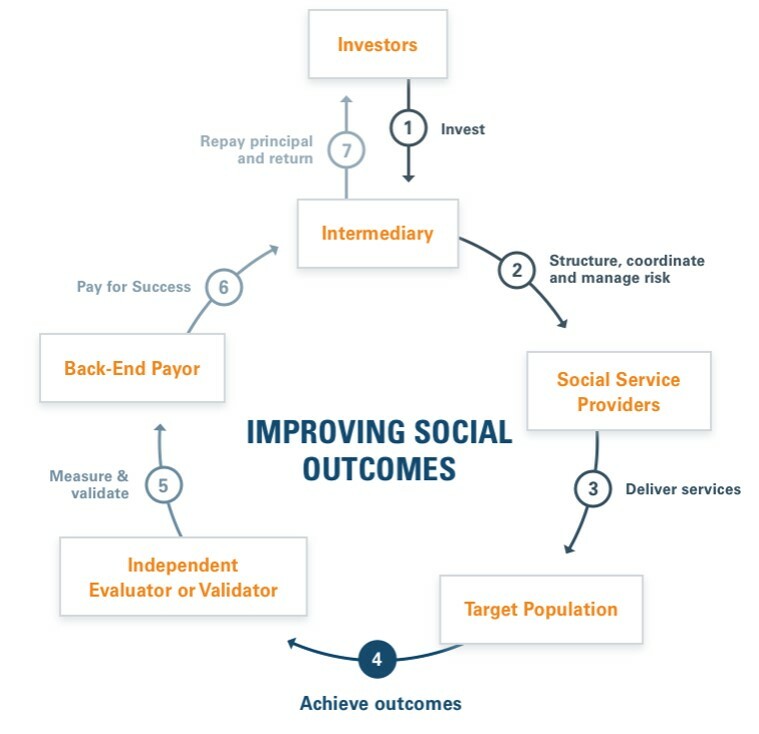 Social enterprises work to retrain ingrained systems such as banking, food production, education, workforce training; they often work against social norms, attitudes, and human biases. If our goal is to bring more socially focused companies to life, impact investors should account for a higher portion of angel, seed and early stage investments in the investment market. I (humbly) push you to include earlier stage investments in your portfolios AND to demand to be richly compensated for your earlier, higher risk, “rocket fuel” position. Take more equity, more warrants, more board seats, and higher interest rates in exchange for your early, patient capital. 3) Use early stage impact capital in highly focused ways that will catapult us to achieve milestones needed to attract traditional capital to our stack. As the Seed Stage market tightens, trends show that any investment labeled “patient” or “social impact” will naturally be trimmed from the overall pool. 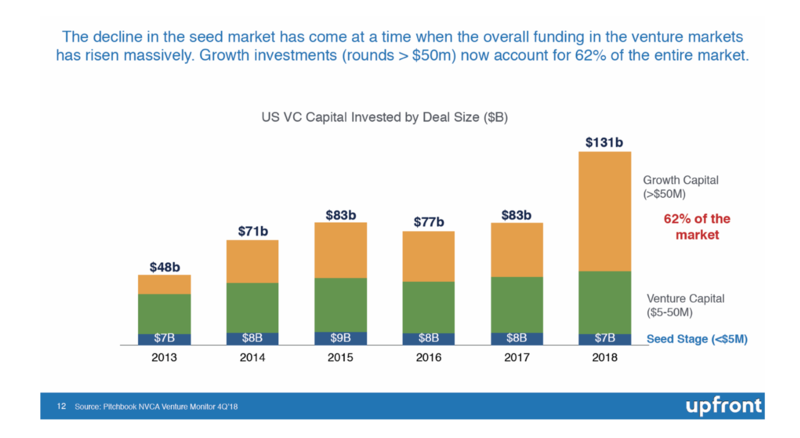 Seed Stage impact investment funds are already fairly rare, with A to C rounds being where most impact funds make their mark. The upside to investors who may choose to position some of their money in Angel and Seed Stage is that early-stage capital comes with a lot of exciting, hands-on opportunities to chart the path of a company. For multi-generational family office investors this may be an ideal fit in that younger members of the family may already be asking for more involvement in investments. The ImPact wrote a detailed guide to bring these strategies to life. The Funding U early investors and board members have given our organization valuable insights and support; and, they each have said they, in return, gained priceless insights and energy from being part of our early growth and maturation. This article originally appeared in Green Money Journal. Growing up in Mumbai, India’s financial hub, it was hard to escape the pervasive Slumdog Millionaire-esque wealth disparities. Coupled with other issues like gender-based violence, Mumbai served as my primer for recognizing that socioeconomic issues like poverty are a systems issue involving multiple, interdependent systems, and can’t be solved by one or two interventions alone. It also lit a fire in me to use a justice-based lens to dismantle the intersecting systems of oppression that create outcomes where a small percentage of people at the top thrive at the expense — and severe detriment — of the majority at the bottom. That fire stayed with me as I moved across continents in 2007 to pursue a dual degree in Finance and Economics at The University of Texas at Austin. It was an interesting time to be studying those topics. Amid the global financial meltdown, I found myself having more questions than answers about our current economic system of capitalism. I decided to shift my energy to grassroots international development and student organizing instead. As part of an interdisciplinary research study on Microfinance and Sustainable Development in Developing Countries, I spent several summers and winters in South Asia researching grassroots development — including an internship with the Nobel Laureate Grameen Bank in Bangladesh. When back on campus during the fall and spring semesters, I spent time organizing with student-led movements around anti-poverty and climate action campaigns. At the time, microfinance (specifically microcredit) was being touted as a panacea of sorts to ending extreme poverty. It involved giving small, uncollateralized micro-loans to the poorest of women so they could start businesses and help pull their families out of poverty. Women were the primary targets of these loans for two key reasons: the data showed that women spent a higher percentage of their earnings on the well-being of their families than men did, and empowering women economically meant empowering them socially as well — which was of particular significance for communities with rampant gender-based violence. In theory, this seemed to work well for a few years. Women that were previously left out of the formal economy entirely were able to start micro-businesses and contribute financially to sustaining their households. However, as microfinance started to scale, questions around its true impact surfaced, and the industry experienced a bubble and crash of its own. One of the main critiques of microfinance was its high interest rate, which often climbed over 35 percent and as high as 80 percent in some markets. Theoretically, the risk/return trade off that institutional finance hinges on justified such high interest rates. The borrowers were the poorest of the poor—often unbanked, without any formal identification, and without collateral to back the loan—thereby making them the most risky investment. But it is important to question who bears the true risk in interventions like this — the lender with wealth or the borrower that is already struggling below the poverty line — and whether there is another trade off at play between scale at “market rate” and real impact. The dark side of microfinance that I bore witness to as part of my research was that borrowers who defaulted on their payments were often left worse off than they were before accepting the loan. The lessons from microfinance, and what I learned subsequently in my career after graduating college, have given me a renewed focus in how I approach my work in this industry of Sustainable Business and Impact Investing. When it was time to think about life after college, I had the choice to either go back home to India and work on grassroots economic development, or stay and find a job in the U.S. I chose the latter with the understanding that so much of what I identified as the root causes of global problems (i.e., capitalism) had its basis and stronghold in the U.S. So after graduating, I went to work at a management consulting firm — one of the few companies that hired international students who required work visas — where I worked my way to our newly minted social impact and sustainability consulting practice. There, I worked with Fortune 500 clients on their sustainability strategies, helping them transition to renewable energy, implement community impact initiatives, and reduce carbon emissions. Much like my experience with microfinance, what soon became apparent and frustrating — millennials are nothing if not impatient, right? — was that all of our work in corporate responsibility was only having an incremental impact at best. But the severity of the problem demanded exponential and transformative change. As businesses continue their pursuit of relentless growth, wealth continues to accumulate at the top while climate change continues to accelerate at a truly apocalyptic pace. And, increasingly, more middle and low-income communities are stripped of their autonomy and power. What impact is Sustainable Business and Impact Investing having on a net basis? As impact investing moves from niche to mainstream, it is critical we ask these questions. The majority of impact investing funds today seek a market rate-return, and while the last few decades have proven that investing for impact can indeed be profitable, we need to question to what extent they need to be profitable. As microfinance has shown us, market returns can help achieve scale, but not necessarily impact. Consider the history (and present) of this country’s economy — built by enslaved labor on stolen land and furthered by free-market capitalism that keeps Black and Brown labor in global supply chains oppressed while continuing to extract natural resources at unsustainable rates. What does a market-rate return perpetuate in a market that is based on these fundamentals? Bringing this line of questioning home, I examine my personal finances by asking myself three overarching questions: How am I making money? How am I investing it? And how am I spending it? As I’ve transitioned from working a job to becoming a full-time social entrepreneur, I routinely ask myself if I’m making money in a way that allows me to have the impact I want, or if I’m unintentionally reinforcing oppressive systems. From an investment perspective, at a minimum, I recommend examining your banking relationship. I opened an account with a credit union last year and am working on fully transitioning out of my current account with a large bank. We millennials love our convenience, and while credit unions don’t always offer the same online banking experience as the bigger banks, they also don’t do the same kind of harm. Most multinational banks fund (with our deposits) private prisons and pipelines that destroy indigenous lands, while community banks and credit unions are more likely to fund small businesses in our communities. If you have an IRA/401K along with a regular savings account, you can also look into platforms like Swell Investing and OpenInvest or work with a fund manager to screen for and divest from investments in the weapons industry, fossil fuels, etc. I also invest a portion of my savings with RSF Social Finance through a social investment fund note. The returns are small and fixed — but at 1.25% they’re greater than what you’d make if the money was in a savings account, and it’s comparable from a liquidity standpoint, and you get the opportunity to directly invest in social enterprises that are making an impact on issues you care about. If you’re a millennial with sizable wealth, you can even go a step further: Millennial-led organizations like the left-leaning Resource Generation are committed to investing in the equitable distribution of wealth and power. And finally, am I spending money on ethical consumption or am I contributing to our impending ecological crisis? Do I have a giving strategy that is proportionate to the amount of money I save? I still have a long way to go, but asking myself these questions along the way helps me recenter and refocus my priorities. The most important work of our time, is building a new economy that is based on entirely different fundamentals than our current extractive economy, and it’s heartening to know and work with so many of my fellow millennials who are leading the charge. Nikishka Iyengar, a systems entrepreneur working at the intersection of finance, climate action and racial justice. She is the founder and CEO of The Guild, an organization focused on building community wealth through equitable and entrepreneurship. She is also the owner of Whole Systems Collective, an impact consulting collective working towards a just and regenerative economy through two key initiatives – the transformation of our financial systems, and climate action through carbon drawdown and responsible stewardship of our natural resources. Previously, as a sustainability consultant at a top management consulting firm, she helped her clients unlock ~$1B worth of value from renewable energy, water stewardship, and emissions reduction opportunities. Then, as a product manager at a waste tech startup, Nikishka built software (including artificial intelligence products) to allow companies to uncover waste diversion opportunities within their supply chain and operations. Nikishka was recognized by GreenBiz as a “30 under 30” emerging leader in sustainability. She has a BBA in Finance, a BA in Economics and an Interdisciplinary Certificate in International Development from The University of Texas at Austin. How do you measure the social impact of technology investment? It’s a big question TechBridge has been working to answer for nearly 25 years. In 2001, TechBridge held our first annual Digital Ball, inspired by the Silicon Valley Charitable Ball, where we gathered local CIOs and technology leaders of major companies together to celebrate success over a black-tie gala. Proceeds went to TechBridge, with a mission to use the funds to bring the power and benefits of technology to local nonprofits in need. The results have been overwhelmingly successful. Today, hundreds of nonprofits have benefited from TechBridge services, and the Digital Ball attendance has grown to over a thousand technology leaders (the largest event of its kind in our city), expanding from a single event in Atlanta to a series of events held across communities in Georgia, Alabama, and Tennessee. As TechBridge has grown, so has our need to standardize how we capture and communicate the outcomes of our technology investments. Inspired by efforts in the social impact arena to quantify the value of social investments in dollar terms, through metrics such as Social Return on Investment (SROI) and Impact Multiplier of Money (IMM), TechBridge has developed an internal tool, referred to simply as the “ROI Calculator,” to demonstrate the value of our technology investments in terms of dollars saved, hours saved, and additional clients served over a 5-year period. In July, TechBridge began requiring all technology projects to capture and report on ROI metrics at the beginning of the project, the end of the project, and six months following the project completion. The additional rigor has been well received by the nonprofits we serve, who are able to report the outcomes back to their own funders and board members. 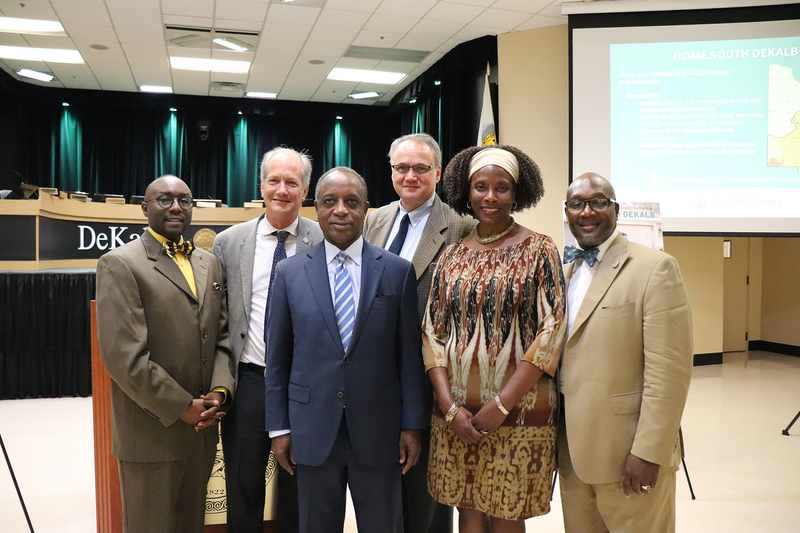 The Atlanta Mission, a network of shelters for the homeless including the city’s largest men’s shelter, was able to win board approval and raise the funding needed for a major overhaul to their donor management system after TechBridge calculated the project’s value at over $100,000 per year in annual cost savings and a 5-year ROI of 216%. Rainbow Village, a transitional housing program for families in Duluth and recipient of the TechBridge 2018 Dream Big Georgia Award, included TechBridge’s ROI Calculator estimate in a grant application to the Episcopal Community Foundation for Middle and North Georgia. They won approval, giving them the additional funds needed to implement a newly customized Salesforce-based client management system. The new system is scheduled to be up and running by the end of this summer and estimated to save Rainbow Village $18,900 per year through reducing staff member time required to manually enter, aggregate, and report on client metrics. We are thrilled to share these stories of success, and our journey of measuring the impact of technology investments is continuing to grow and evolve. 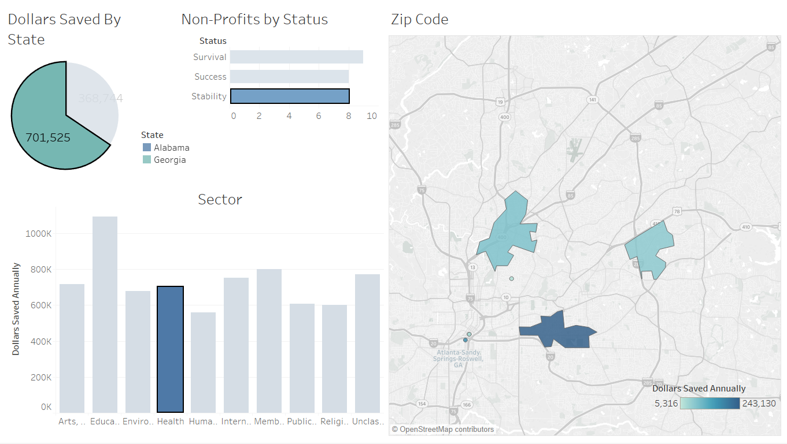 Thanks to a collaborative project with a Georgia Tech student group, Epic Intentions, TechBridge has developed an ability to visualize outcomes from the ROI Calculator using Tableau dashboards. In March, TechBridge will co-present with Los Angeles-based Mercy for Animals and Chicago-based National Immigrant Justice Center on the ROI Calculator at NTEN’s 2019 Nonprofit Technology Conference. 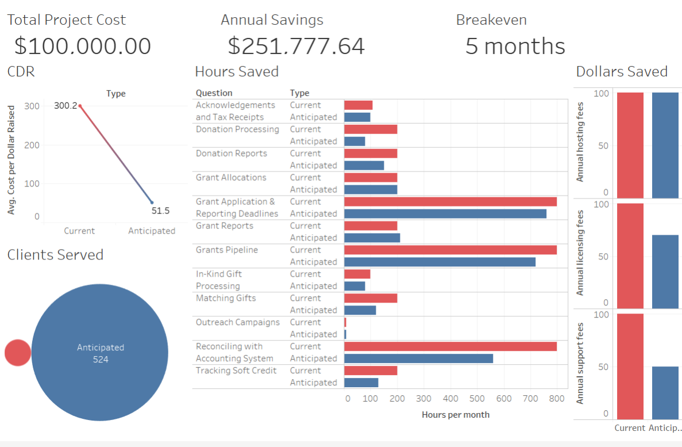 Finally, TechBridge is now taking the additional step to translate the direct outcomes of technology investments (dollars saved, hours saved, and clients served) into the estimated economic impact of those outcomes to society. By connecting our ROI data to evidence-based academic studies, we hope to deepen insights into our technology investments and answer questions such as, “What community savings have we achieved through the reduction of uninsured emergency medical costs as a result of increasing the capacity of The Atlanta Mission or Rainbow Village through technology?” The process is complex, but we are beginning to achieve real results by leveraging existing tools, such as the Low Income Investment Fund’s (LIIF) Social Impact Calculator, as well as investing R&D funding into our own technology which we hope to bring to market later this year. TechBridge is a nonprofit that arms other nonprofits on the frontline of alleviating the causes of poverty with technology that will allow them to expand the impact of their mission for the millions of men, women and children who suffer from lack of access to shelter, food, employment, education, healthcare, and financial literacy. Since 2000, they’ve provided IT consulting and services to thousands of nonprofits nationwide and in seven countries. By matching the needs of nonprofits with the skills and financial resources of the technology community, TechBridge helps nonprofits harness the innovative technology and best practices long enjoyed by the corporate sector.